This week sees the 25th anniversary of Landcare in Australia. What many don’t realise is the tremendous impact that the model has had in developing countries. 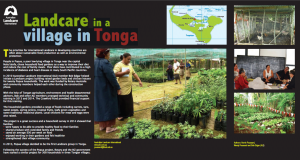 The Fund has supported training around Landcare in a range of countries, most recently in Tonga. The following is from the poster below, Landcare in a village in Tonga, that has been produced for the Australian 25th celebrations. In 2010 Australian Landcare International (ALI) member Bob Edgar helped initiate a Landcare project building raised garden beds and chicken houses for twenty Popua households. The work was funded by Rotary Australia and community members helped each other during the construction phase. With the help of Tongan agriculture, environment and health departmental advisers, Bob and other ALI members arranged technical and community training in 2013 and 2014. The Crawford Fund provided financial support for this training. The household gardens provided a range of foods including carrots, taro, sweet potato, spring onions, tropical fruits, leafy green vegetables and some traditional medicinal plants. Local chickens for meat and eggs were also raised.